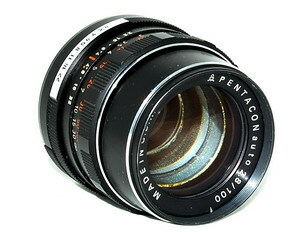 Pentacon 100mm f/2.8 pretty rare excellent portrait lens, little brother of very popular Pentacon 135mm f/2.8. Optical quality I guess same, both are excellent lenses. Little soft at wide open, that is makes them to ideal portrait lens. I found this lens has great optical quality and so horror mechanical build. Aperture blades looks somebody make them at home and other parts are also not comparable with quality Japanese makers. So if you intended to buy this lens, make double check before purchase and try to get in local camera shop instead from remote source. Pentacon lenses except 135mm focal length, last ones in my order priority, because they are medium or lower level quality.Don't mix them with Meyer-Orestegor , Meyers are truly fantastic lenses, but not Pentacons.What can I say more ? Small handy lens, easy to set right focus and pretty sharp at wide open, it has nice bokeh and color rendering.